But Chow is not the frontrunner — and her fate depends almost entirely on how the pool of center-right Toronto voters divides up. Chow already has a national profile as the widow of the former leader of the New Democratic Party, Jack Layton, who led the NDP to a historic victory in the most recent federal election in May 2011. Layton, just three months after becoming the official leader of the opposition, tragically succumbed to cancer. Chow, in many ways, personifies the cause of progressive politics even more than Layton’s successor as NDP leader, Thomas Mulcair. Born in Hong Kong, Chow also personifies the immigrant tradition of the late 20th century to Canada — it’s important to remember that one out of every two Toronto residents today is foreign-born. Chow came to Canada with her parents at age 13 and grew up in Toronto’s St. James Town neighborhood. She joined Toronto’s metropolitan council in 1991, as a champion of public transport, homeless issues and education. In Toronto, both before and after the 1998 municipal amalgamation that expanded ‘Toronto’ into the larger jurisdiction that we know today, Chow was a progressive legislator who sometimes criticized the development-heavy agenda of former Toronto mayor Mel Lastman. 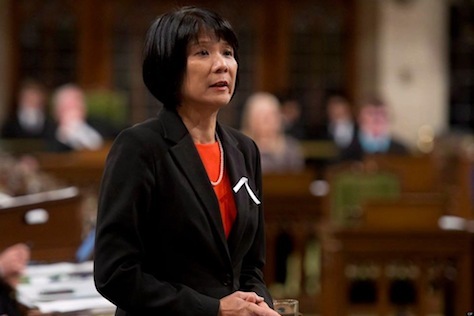 Chow made the jump to federal politics in 2006, when she was first elected as an NDP legislator in 2006 from her Trinity-Spadina constituency in Toronto, her third attempt to win a seat in the House of Commons. With a national, high-profile image and a strong connection to Toronto, first as an immigrant, then as a council member, and since 2006 as a member of the House of Commons, Chow would be a formidable candidate. What’s more, she’ll be facing a splintered right — incumbent Rob Ford seems determined to fight for reelection, former Ontario Progressive Conservative leader John Tory (and the 2003 mayoral election runner-up) is also waging a strong campaign, and Karen Stintz, Toronto councillor since 2003 and chair of the Toronto Transit Commission from December 2010 until last month, when she stepped down to mount her mayoral campaign, is a young and attractive candidate who could gain support as the campaign grinds forward. But unless Chow can grow her support beyond her natural base, and unless Chow can keep the conservative candidates fairly well divided, it’s not clear that there’s a path for a progressive candidate like Chow to win the mayorship. Ford, despite problems with which nearly everyone in North America is now familiar, is defying political gravity. He’s admitted to using crack cocaine, abusing alcohol, and he’s currently under investigation by Toronto police. The Toronto city council stripped him of nearly all powers late last year at the height of the crack cocaine scandal. He’s one of 2013’s most poignant punchlines. And yet. Ford’s resilient. Just watch his turn on Jimmy Kimmel’s show last week if you want to see how he can transform himself from a late-night punchline to a sensitive victim, just your average-Joe mayor doing his best to represent his constituents who, by the way, are invited to call Ford’s personal phone number at any time. 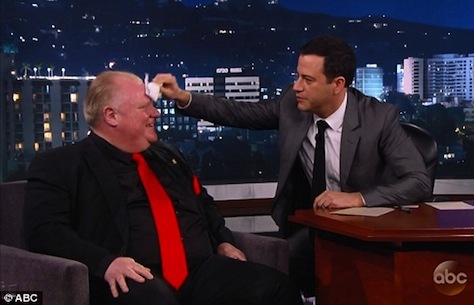 No matter if you think Ford (pictured above) deserves a second term as Toronto’s mayor, you can’t help but root for the poor guy as Kimmel subjects him to watching gaffe after gaffe — some of which are inexcusable lapses of professional judgment, some of which are just human failings. The vicious backlash against Ford is one of the reasons so many of his core followers within ‘Ford Nation’ have continued to support him, even through the worst of the crack cocaine allegations and admissions last year. What’s more, when he swept to power in 2010, Ford won everywhere in greater Toronto, except inside the boundaries of ‘old Toronto’ — he won the near suburbs in York and East York as well as the farther suburbs in Scarborough, North York and Ford’s own Etobicoke. Surprisingly enough, it’s the suburbs that have a higher immigration percentage — and plenty of those immigrants supported Ford in 2010. It explains why, in the most recent Feb. 24 Forum poll, Ford tied with Chow for the lead at 31%, with Tory following close behind at 27% and Stintz at 6%. Another candidate, David Soknacki, a former Toronto councillor, budget chief and businessman, would win 2%. Ford actually gained quite a bit of support back in the last few months, notwithstanding the brutal fallout from the back cocaine scandal. Despite the somewhat unorthodox nature of his campaign and his mayoral administration, he’s still very much in the hunt for reelection. That suits Chow just fine, who performs best when Ford, Tory, Stintz and Soknacki all divide center-right Toronto voters. But if Ford is indicted or convicted or imprisoned in the next eight months, or if he somehow convinces his legions of loyal supporters that he’s no longer a viable mayoral candidate, Tory seems perfectly capable of consolidating support from conservative voters. And that’s something that should worry Chow, who pulls just 31% against 66% for the non-Chow voters now supporting Ford, Tory, Stintz and Soknacki. The appropriately named Tory (pictured above) is no slouch — and no one was expecting his decision to enter the race late last month after years of apparent indecision. Tory lost the 2003 mayoral election to David Miller by 5.23%, a much narrower margin than Miller’s 2006 reelection or Ford’s 2010 double-digit defeat over George Smitherman. A relatively centrist official, he defeated the more conservative Jim Flaherty to win the leadership of Ontario’s Progressive Conservative Party in 2004 (Flaherty left Ontario politics for federal politics, and since 2006, he has served as finance minister under Conservative prime minister Stephen Harper). Tory failed to lead the PCs to victory in Ontario’s 2007 general election, and Tory himself lost his own riding to Kathleen Wynne, an Ontario Liberal who subsequently won her party’s leadership in January 2013 and now serves as Ontario’s first female premier — and Canada’s first openly LGBT premier. 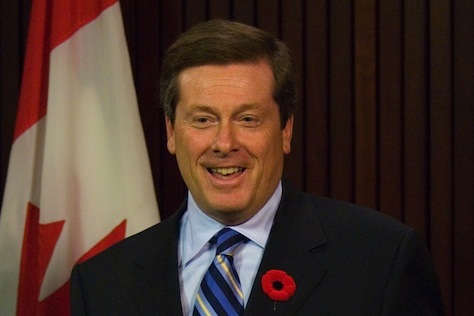 Since stepping down from the Ontario PC leadership in March 2009 (his successor Tim Hudak also failed to win the 2011 Ontario general elections), Tory developed a new career in radio commentary and though he ultimately passed on a 2010 Toronto mayoral bid, his 2014 bid brings into the race one of the most talented center-right politicians in Ontario. If Ford’s supporters abandon him, Tory stands to gain the most, even if just a plurality of ‘Ford Nation’ ultimately back him. Stintz and Soknacki, for their part, are hoping that if Ford Nation splinters, they’ll look beyond Tory, a longtime fixture in Toronto and Ontario provincial politics, to fresh conservative faces that are campaigning by promising all of the substance of a second Ford term without Ford’s personal shortcomings and Tory’s professional political aura. If Bill de Blasio could become mayor of New York City by outpacing senior municipal leaders, certainly Stintz and Soknacki have a shot in Toronto. All three have focused on broadly ‘Ford Nation’ themes — lowering spending and government accountability, even if Toronto’s municipal spending wasn’t all that wasteful and its government relatively accountable even before Rob Ford came along. All three have endorsed the long-mooted ‘Downtown Relief’ subway line for Toronto, a position that Chow might even come to endorse in the days ahead. That might be enough to outpace Chow. Though she enters the race today amid national fanfare, the next eight months will mark some of the most fiercely contested political campaigning in recent Canadian history.